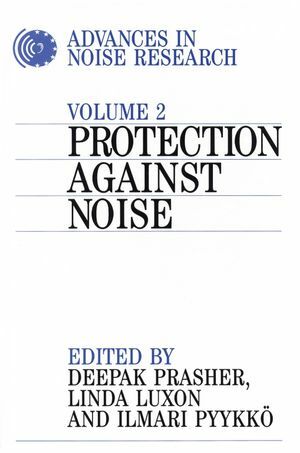 The second volume in the series focuses on protection against noise and covers the problem of noise worldwide, the issues relating to leisure noise, European databank, and hearing conservation. Deepak Prasher, Institute of Laryngology and Otology, University College London, UK. Linda Luxon, Great Ormond St Hospital, UK. PART 1: THE PROBLEM OF NOISE. Chapter 1. Noise-induced hearing loss - a global problem (PW Alberti). Chapter 2. The World Health Organization and the prevention of deafness and hearing impairment caused by noise (AW Smith). Chapter 3. Quality of life, noise and hearing (R Hinchcliffe). Chapter 4. Noise-induced hearing loss: current status in Greece (Miltos Tsalighopoulos). Chapter 5. Hearing thresholds of workers employed at the public power corporation (Miltos Tsalighopoulos, P Zafiropoulos, K Martkou, P Lalaki and I Daniiilidis). Chapter 6. Noise as a public health problem in Nordic Countries (Einar Laukli). Chapter 7. Incidence of occupational deafness in Poland 1991-95 (WJ Sulkowski, S Kowalska, M Sliwinska-Kowalska, Z Starzynski and G Krzyowicz). Chapter 8. Defining (minimal) hearing loss in children (Sue Bellman). Chapter 9. The risk of sensorineural hearing loss from noisy toys and recreational activities in children and teenagers (Alf Axelsson). Chapter 10. Noisy toys: a case for determining the hazard and safety levels (Deepak Prasher and Manjula Patrick). Chapter 11. Personal cassette players: a hazard to hearing? (Irene Felchlin, Beat W Hohmann and Laszio Matefi). Chapter 12. Risk of hearing damage from attendance at discotheques and rock concerts (Ewa Raglan and Deepak Prasher). Chapter 13. Childhood hearing loss in Portugal (Mario Andrea and Oscar Dias). Chapter 14. Development of a European databank for noise-induced hearing loss (Deepak Prasher). Chapter 15. Types of database that include nopise-induced hearing loss (Mark E Lutman). Chapter 16. Security need for a EU database (Esko Toppila). Chapter 17. How to combine data harvested using different audiometric techniques (Stig Arlinger). Chapter 18. Hearing loss caused by solvents and other chemical agents (Ann-Christin Johnson). Chapter 19. Evaluation of work history - what parameters are needed for the database (Stig Arlinger). Chapter 20. Estimating noise exposure: methods used in UK epidemiological surverys (Mark E Lutman). Chapter 21. Databse and model: Noisecan (Jukka Starck, Anders Pihlstrom, Esko Toppila, Yrjo Auramo, Martii Juhola and Ilmari Pyykko). Chapter 22. Dependency on magnesium of hearing threshold shift after impulse noise exposure (H Ising, F Scheibe, H Haupe and B Generdzki). Chapter 23. Reduction in temporary and permanent noise-induced hearing loss by oral magnesium intake (J Attias, Z Joachims, I Bresloff and E Rozenberg). Chapter 24. Timely issues concerning hearing protectors (Guido F Smoorenburg and Marie-Louise Barrenas). Chapter 25. What kind of protectors are used in the EU and is their use mandatory? (Esko Toppila). Chapter 26. The evaluation of protection efficiency of hearing protectors for hearing conversation programs (Esko Toppila, Jukka Starck, Anders Pihlstrom and Ilmari Pyykko). Chapter 27. Selection of hearing protectors to be used in noise areas in road traffic or railway systems in Germany (Martin Liedtke). Chapter 28. EARTALK - hearing protector and communication system (Chucri A Kardous). Chapter 29. Field assessment of hearing protector peak level attenuation in impulse noise (Guido F Smoorenburg). Chapter 30. Hearing conservation (Marie-Louise Barrenas, P-A Hellstrom and Jukka Starck). Chapter 31 Development of a sophisticated hearing conservation programme (Ilmari Pyykko, Risto Kaksonen, Esko Toppila, Yrjo Auramo, Jukka Starck and Martti Juhola). Chapter 32. Motivation for the hearing conservation program - factors explaining the variability in hearing loss (Ilmari Pyykko, Jukka Starck, Esko Toppila, Martti Juhola, Yrjo Auramo and Hisayoshi Ishizaki). Chapter 33. A group-rehabilitation model for males with noise-induced hearing loss and their spouses (Marie-Louise Barrenas). Chapter 34. Are pure-tone audiometry and speech recognition scores in noise a better choice to assess hearing disability and handicap than self-reports? (Marie-Louise Barrenas). Chapter 35. Lack of awareness of the risks of noise exposure in men and women (Lillemor R-M Hallberg).